Previously on my blog we discussed Zionism and the Israeli-Palestinian Conflict and its history. But do we really know what actually goes on? While the US condemns(-ed) Israel’s constant expansionist techniques, we rarely hear about this or Israel’s retaliation techniques in our mainstream media (go figure). I only recently began seeking out the realities of what has really been happening. I would never, under any circumstances condone terrorism, suicide bombings or anything of the sort, but doesn’t it make you wonder what drove people to such madness? Everything on earth happens and exists because of cause and effect, and it’s hard for me to believe that young people are willing to strap themselves with explosives and die taking other lives because of simple annoyance. There must be a bigger picture. I started to read Witness in Palestine: Journal of a Jewish American Woman in the Occupied Territories by Anna Baltzer. If no one reads anything else about Palestine, I hope they would decide to read this book. The major theme of the text talks about Israel’s method of annexing land to build a wall between Israel and the Palestinians. The wall is, quite literally, to block Palestinians from entering Israeli land. However, Israel has blocked off all means for Gaza and the West Bank to support itself – access to food, clothing, medicine, jobs, electricity, etc. To annex, Israel will first usually offer the family money for their home. This offer is usually no where near the actual monetary value of the land, let alone the sentimental value. Most of the land that is “annexed” is that of olive farms passed down father to son for hundreds of years. It’s said that some of the olive trees that survive in Palestine today were there when Jesus began his ministry. When the family refuses the offer, the Israeli guard will come with bulldozers and rip out their home and their farms from their very foundation anyway. Then they will then claim the land for Israel since no one “technically” occupies it any longer. “We watched a calm old farmer finally lose his composure as he watched his livelihood uprooted. Sobbing, he got down onto his knees in front of the soldiers and begged them to stop the bulldozers. When his tears were met with stone faces he began moaning and swaying until the cloth rag on his head began to fall off. His friend tried to calm him down, but he was past control. He lifted his arms up towards the sky and cried, “Allah w-akbar!” Then he fell to the ground and started crawling around grabbing handfuls of dirt, letting it run through his fingers. He watched it fall, and then looked up at the soldiers, imploring them to stop his misery. And this is the least of the atrocities. The book also speaks of four farmers who were shot when they approached the guard and asked them to stop the bulldozing of their land. The did not throw rocks, they did not carry weapons. They verbally pleaded with the guard, who in return, fired bullets. In 2002, on two separate days (one right after the other) two pregnant women were shot at Israeli checkpoints, while in labor and on their way to hospitals to give birth to their babies. The story of Maysoun Hayek was published by The Independent, a U.K. newspaper. Maysoun, her husband and her elderly father-in-law, while on their way to the hospital in nearby Israeli territory, passed safely though one checkpoint and were given permission to proceed. As they approached the next, her husband was shot in the neck and killed. She and her father-in-law were also injured. The army claimed they tried to bypass an earthen baracade, so they opened fire on the car. If you read any other non-American news source (such as BBC), almost daily you will read about happenings in Israel/Palestine. The US and her media tend to turn a deaf ear, or generally play it up as thought this tiny, tiny piece of earth and its few inhabitants constantly terrorize the poor, poor little Israel. Yes, Israel, that, to this day, remains the recipient of the largest amount of United States’ foreign aid (and weapons), closely followed by Egypt. Many people have their conspiracy theories about why the U.S. media disassociates itself from the realities of the conflict. Most would probably say it’s because the media is owned by Zionists or that we have Zionist lobbyists controlling our government – maybe it’s true, maybe it’s not. Maybe it’s just easier for America to continue its imperialistic oil-hoarding ways in the Middle East by painting a picture that the “Promised Land,” held so dear and true by the vast populous of Evangelicals is constantly terrorized by those evil Arabs. Who knows? However what we do know is that we, as Americans, have generally no clue of what actually happens, or for whose side they should actually be fighting. I’m back from a much-needed month-long hiatus to write about something near and dear to my heart: Zionists and the hatred thereof. This is the first of a three-post series about Zionism, the Israeli-Palestinian Conflict and America’s involvement. Now, I’m definitely paraphrasing, so if you want a completely unbiased history, pick up a book, or for God’s sake, at least Wikipedia. Since I know most are unwilling/incapable, I will try my best. Zionism is a movement to return Jews to their “homeland” which happens to basically be Palestine. Now, this isn’t the problem – Jews returning to their homeland. The problem is, really, how their homeland was created out of Palestinian land. Though many do not understand this, Israel has not been a nation that dates back to Jesus’ time. It was important to Jews, yes, and some considered it the “Promised Land,” but it was not the Jews’ property until the State of Israel was created in 1948. While Zionism had been a movement since the late 1800’s, things really didn’t heat up until after World War II and the Holocaust sent some thousands of displaced Jews out to find new homes. Palestine had been under British rule since 1922, so Britain decided to send the unwanted (because seriously, that’s what they were by Western Europe, mostly) Jews to Palestine. This, in turn, angered the Palestinians and a conflict between the Jews and the Arabs arose. Britain decided they could not reach an agreement between the two groups and decided to withdraw their control over Palestine, though they left the Jews in the land. The UN stepped in to create two countries, Palestine and Israel, and while the Jewish group gladly accepted the deal, the Arabs did not. Regardless, Israel was declared a nation one day before the British rule over Palestine was to expire in 1948, and the Arab nation of Palestine was never made official. This left the areas formerly known as Palestine that were not yet annexed as Israel up for grabs. Thus creating the Arab-Israeli Conflict that exists to this day. Five Arab nations – Egypt, Syria, Jordan Lebanon and Iraq – then declared war with Israel in 1948 immediately after Israel’s declaration of independence. Jordan annexed the West Bank and Egypt the Gaza Strip. However, in the Six-Day War of 1967, Israel seized control of both the West Bank and Gaza Strip. This created even more anger and frustration, and so goes the story. Read more from The Zoo. Just a coincidence that we haven’t heard a lot about this in mainstream media? I think not. These are people’s votes! I mean come on! This should be plastered all over the news networks and dealt with! Instead we’re talking about whether Al-Qaeda is going to swing our vote. I think if we can’t cast our vote for whom we choose, it really doesn’t matter what Al-Qeada has to say. Posted in Politics | Tags: corporate media blows, John McCain, media bias, Obama/Biden 08, wth? You all well know that I’m supporting Barack Obama in this election. And while my whole family (mostly Republican) is also turning out for Obama this year, my grandpa, whom I love dearly, is standing firm in his support for McCain. I poke fun, I argue and debate, but in the end, I do not respect anyone less as a person for voting against my political choice. After all, my freedom to choose constitutes everyone else’s freedom to choose. However, I will under no circumstance tolerate ignorance and unfortunately, it has been passed like a rampant disease among McCain supporters. We’ve heard everything from Obama’s a terrorist “paling around” with Bill Ayers to being a Muslim jihadist, to a Black-supremacist Christian. While we all have had the truth about Ayers regurgitated over and over thanks to Hilary and John, which is it? Is he an extremist Muslim or and extremist Christian? It’s certainly hard to make someone into both – unless you’re Fox News, of course. with words such as “terrorist,” “hatred,” “death,” and “destruction.” And where did all this Islamophobia come from? If there are Muslim Americans (like myself) they certainly didn’t come here to stir the pot. The converted (like me) into Islam after being born and raised with American culture and values, they left their countries of tyrany to come here, or they came to live out the American Dream – just like everyone else. September 11th and other acts of terrorism around the globe are just as condoned by Muslim Americans (and Muslims around the world, mind you) about as much as black lynchings and abortion clinic bombings are condoned by Christian Americans or dare I say, the Holocaust by Germans. After all the KKK and Neo-nazis are ” Protestant Christian” organizations, are they not? …only as much as Al-Qaeda and other such groups are “Muslim” organizations. But people seem to forget the past and Islam has become the scapegoat for all modern evils. It’s foreign, relatively new and misunderstood, and therefore “scary” and conveniently easy to distort. At a McCain rally in Woodbridge, VA, a man and a female partner were spotted by an American News Project journalist. While shouting anti-Islamic balderdash, anti-truths about Obama’s history, and anti-socialist remarks, he handed out bumper stickers that said, “Obama for Change.” The ‘C’ was replaced with an Islamic symbol, the crescent moon and star, and the ‘G’ with hammer and sickle made (in)famous by the Communist Soviet Union. He was approached and refuted by a group of Muslims, a Muslim campaign worker, and other McCain supporters attending the rally. I think his female partner has learned her press skills from Sarah Palin, and I’m glad they walked away. They were obviously very wrong, as most people are, with their opinions and assumptions that Obama is in any way a Muslim, or that being a Muslim, in general, is something to be ashamed of. When I saw this clip on CNN today, it reminded me of the rally in Wisconsin where the lady stood up and said she can’t trust Obama because he’s an Arab. While John McCain corrected her, and rightly so (kudos, John), it makes me wonder how many people let their votes me swayed by such ridiculous bunk? My attention snapped back to the screen when I heard mention of Colin Powell. I’ve always personally respected Colin Powell – how could you not? Regardless of party, I’ve never heard anyone have too many negative things to say about him. While he donated a great amount to John McCain’s campaign in the beginning, and it was speculated he may become McCain’s running mate (which would have made a world of difference in favor of McCain in my opinion), he recently denounced his support for the McCain campaign on Meet the Press. While I was more than happy about his decision to support Barack Obama’s campaign (obviously), I was overjoyed and impressed by the other content of his interview. He spoke about the [Republican] party straying too far to the right for his liking, McCain Camp straying from real issues that need to be addressed and about the Islamophobia that has gripped the nation. What he said about being Muslim is true. When did choosing your own religion label you as unpatriotic and impossibly American when our on first amendment states FREEDOM of religion? Why is it so hard to comprehend a Muslim president? 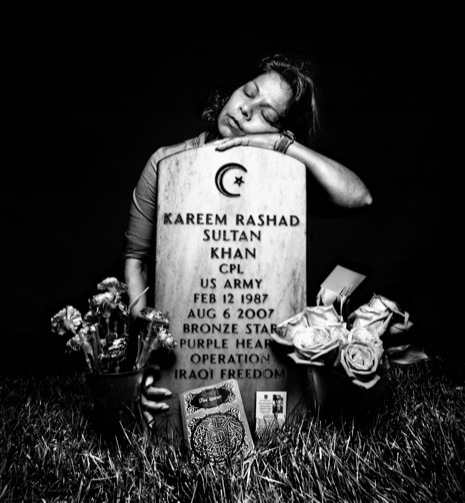 Gen. Powell mentioned a mother who was photographed in The New Yorker at Arlington National Cemetery over the headstone of her son, Kareem Rashad Sultan Khan. He was 20 when he died, and 14 at the time of September 11th. I feel sad for this mother to have to constantly listen to the anti-Islam banter knowing her son gave his life for an unappreciative country. I feel sorry for those who turn out to support their candidate and meet haters along the way. I feel scared for my children and my family as we live in and face a nation of ignorance and intolerance. However, Mr. Powell gave me a second wind. Finally someone stood up to speak the truth and the reality of the situation in a mature and educated fashion. And all out of the mouth of a Republican, nonetheless. Who’da thought?